One of my favorite things about traveling is looking for signs while I’m walking. When they are directional signs they can be very useful because as a visitor I’ve noticed that it isn’t always clear how to get to a place. I also appreciate signs for food and treats, especially gelato. When I was in Madrid I thought that the ceramic tile street signs were very decorative. Later I saw replicas of these signs for sale as souvenirs at gift shops. There were a variety of signs that I remember from Madrid and here are some of them. Signs and their reflections can also be seen. 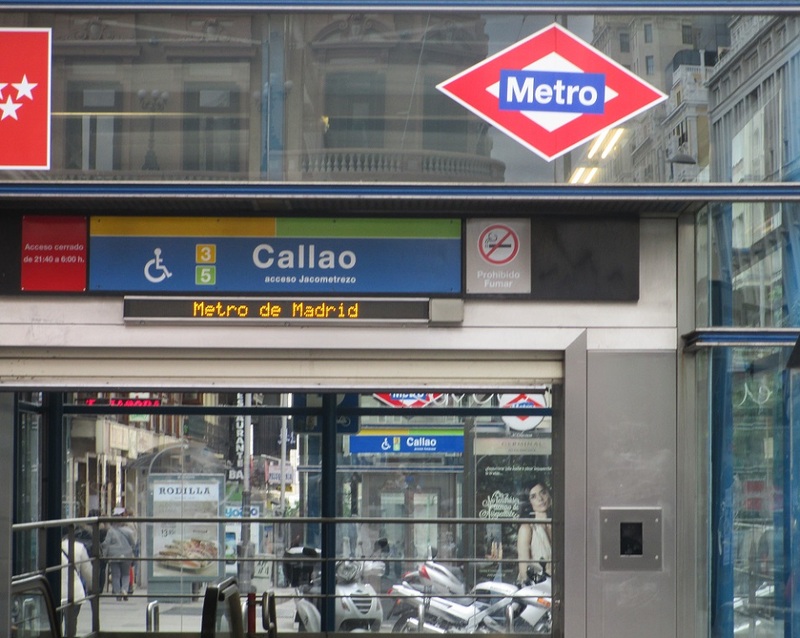 This entry was posted in Madrid, Spain, Travel and tagged gelato, refrigerator magnets, signs. Bookmark the permalink. I know we have Google maps these days but where would we be without directional signs and street names hanging pinned to the walls. I think the ceramic tile sign is very stylish. I really liked the tile sign too – it was pretty as well as functional! I love the ceramic tile street signs in Spain as well, although sometimes they are difficult to read until you are up close. (Makes it hard when you are in a car and looking for an address.) They are pretty though. I can see how it would be difficult when you’re trying to read them from a car. It was much easier to admire them while you’re walking! Thank you – it was a fun theme! I love the signs in Europe and even some of the older style back home… just so pretty as well as functional. I like the tile sign, beautiful! It was so pretty that I had to take this picture – it’s a fun souvenir! I was really impressed at how pretty the tile signs were – they were so decorative! Those souvenir sign magnets are calling to me! Great collection, Meg! The tile signs are really nice. I thought so too – they are really unique! You know? Sometimes I have trouble with American English signage. I was just helping my husband with his driver license renewal and going through the booklet and looking at the signs I was made very insecure! I’m not sure I’d do well in other countries, but metro seems consistently recognizable! At least I could figure out how to get about by train or bus! Driving..not so sure! I definitely prefer walking or using public transportation when I travel – that way I can take lots of pictures and see everything too! Like you, I was very taken with the ceramic street sign tiles in Madrid…. These are all just fantastic and oh so interesting. Thanks for sharing. Thanks Teresa – these are some of my nicest memories of Madrid! I live in a state that’s considered to have the worst signage in the country. And it’s true! I have no sense of direction, so signs are really important to me. Ceramic signs sound so nice and look nice too! I’m not too fond of symbols replacing words, though – sometimes I wonder who comes up with these symbols, they mean nothing! I also like signs that have words, although I think a sign with an extra large ice cream cone is helpful. That is something I can understand! That must have been so memorable – Madrid is a beautiful place! I love the ornate Spanish (and Portuguese) street signs, Meg. Never seen them for sale but I would be:) very tempted. They’d make a good garden feature. I really thought the signs were lovely and I’m so happy to have these pictures as souvenirs! I like your idea Jo – they would be charming in a garden! I love signs too and the tiled street one is especially pretty Meg! Thanks very much too for following my blog and liking my latest post on the Swiss languages – I really appreciate the support! I’m loving the wonderful blogs and bloggers I’m getting to know since I started up my WordPress blog. I haven’t yet been to Spain (though my daughter has recently travelled there) so it’s on my wish list and I would love to explore more. I believe Madrid has some wonderful Hapsburg palaces which would be right up my street :) I’d also love anywhere that had signs pointing to gelati! I was really impressed by all the wonderful signs! I liked that tiled street sign as well as the one for gelato… :) I’m looking forward to keeping up with your adventures too! Excellent idea for a post. Very beautiful signs. Thank You showing them. Thank you – I thought that the signs were really interesting and charming too! Great post. The first town I visited in Spain was Ronda and although it was ten years ago I still vividly remember the beautiful tile sign announcing the name of the town… I have to dig that photo out!